Jack Russell Terriers are playful dogs that are really popular in the United States. They are known as Jack Russells or Jack Russell Terriers, with two other distinct breeds that they are often confused with called Parson Russell Terriers and Russell Terriers. Jack Russells are broader than the other two with the size of between 10 and 15 inches. They are energetic and require a great deal of exercise and stimulation. They also require the right kind of food. Knowing what to look for when it comes to the perfect food for Jack Russells is what we are going to cover in this buying guide. Let’s look at the top five recommended foods for Jack Russell Terriers first, just in case you want to jump right in and get some food for your dog right away without having to read the entirety of the buying guide to make a decision. These are five excellent and highly recommended dog foods for Jack Russell Terriers. 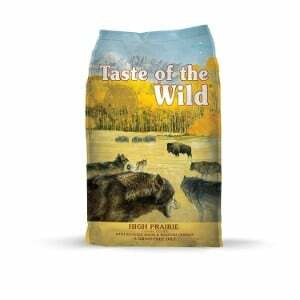 First up is this grain-free dog food from Taste of the Wild, one of the most highly-respected and widely-used premium brands of dog food. 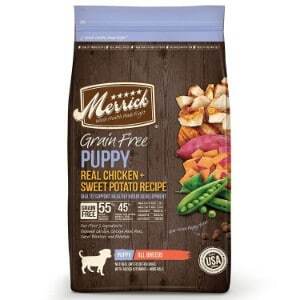 This dog food comes in three different varieties, including the 5-pound bag, the 15-pound bag in the 30-pound bag. What is really unique about this particular food is that the primary flavor is roasted bison. Real meat is the number one ingredient, which is exactly what you should be feeding any dog, but especially a highly energetic one like the Jack Russell Terrier. This could definitely qualify for the best dog food for Jack Russells. In addition to the flavor, another thing that the best food for Jack Russells has is that it features an optimal amino acid profile that helps build lean strong muscles, premium ingredients with vitamins and minerals added in the form of fruits and vegetables as super foods. In addition, the fatty acid blend of antioxidants help with skin and coat health, brain health and much more. The ingredients come from sustainable and trusted sources from around the world and this dog food contains absolutely no corn, wheat, artificial flavors, artificial coloring, preservatives or filler of any kind. This food is extremely digestible and delicious to boot. 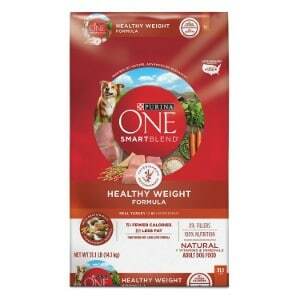 This smart blend from Purina ONE promotes a healthy weight and if you have owned a dog for any length of time – or perhaps even a television – then you have probably heard or Purina ONE. This dog food is turkey flavored, and it comes in several different sizes including an eight pound bag, a 16-pound bag, a 31-pound bag and a 40-pound bag. This natural healthy weight formula is for adults and it is dry dog food that has real turkey is the number one ingredient. This is perfect for dogs that need great dog food but may not be as active as other dogs because it contains 25 percent less fat and 15 percent fewer calories than other formulas that are for more active dogs. It has an antioxidant blend that supports your dog’s healthy immune system and includes natural sources of glucosamine to help with joint health. This food is one of the best Jack Russell foods because it provides just enough calories for this breed to maintain the same weight with the type of activity that is most common with the Jack Russell Terrier. Jack Russell Terrier food generally needs to be just slightly lower in calories than for more energetic breeds and this definitely qualifies. This adult dog food formula offers balanced nutrition and high quality ingredients and rich, tender morsels and crunchy kibble so your dog will love every bite. 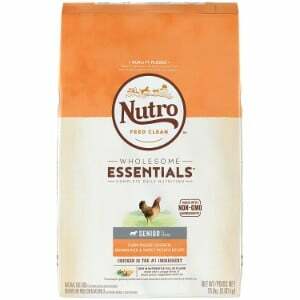 From Nutro comes this Wholesome Essentials dog food that comes in two different flavors – chicken and lamb. It also comes in three different sizes including a 5-pound bag, 15-pound bag and 30-pound bag. These wholesome essentials are specifically designed for older dogs that are at least eight. Older dogs have slightly different nutritional requirements than younger dogs do. For one thing, they do not require as many calories because they are not as active as younger dogs. You definitely want to avoid giving this to puppies though, because they need a very different nutritional profile than what you would feed your senior dog. When it comes to a Jack Russell Terrier’s food, you want exactly what this dog food provides. This senior dry dog food consists of farm-raised chicken or lamb along with brown rice and sweet potatoes with plenty of protein and support for things that senior dogs need like brain health, essential antioxidants to support a healthy immune system even when your dog is eight years old and older and omega three and six fatty acids for a shiny, healthy coat. There are no GMO ingredients in this dog food, and it is completely natural with the balanced nutrition that makes it the best senior dog food for Jack Russell Terrier. Merrick makes an excellent grain-free puppy recipe for Jack Russell Terriers and this one stands out even among the Jack Russell Terrier foods that we have already discussed. Your dog needs high-quality protein and healthy fats. That’s exactly what this dog food provides. It has balanced nutrition with real whole foods that came from actual farms. This is a grain-free formula that is perfect for both puppies and adult dogs and while it can be used for any breed out there it is especially appropriate for Jack Russell dog food. A Jack Russell diet should be all natural, completely free of grains and fillers and have a pretty significant percentage of protein along with at least five percent fat. In addition, all of the vitamins and nutrients that your dog needs should be either included with the ingredients that make up the food or added to it. This dog food uses meat is the primary ingredient and has plenty of protein for your Jack Russell, and it combines that protein with farm fresh fruits and veggies like peas, sweet potatoes and more. That gives you the highest levels of omega-6 fatty acids and omega-3 fatty acids as well as glucosamine, chondroitin and other nutrients that are important for Jack Russell Terriers. Finally, one of the most respected brands out there brings this food for sensitive stomachs. Hill’s Science Diet is one of the most respected brands out there when it comes to dog food, and this one comes in multiple flavors and lots of different sizes. You can choose from chicken or salmon, and you can get a 4-pound bag, a 15-pound bag or 30-pound bag or a 12-pack of 12-ounce wet food. When you give your dog food that is intended to promote a healthy lifestyle, you want it to be based upon research. That’s exactly what Hill’s Science Diet promotes. This food is easy to digest and gentle on the stomach for dogs that tend to bloat up. It comes in small morsels with high quality ingredients providing complete nutrition for your Jack Russell Terrier, and it comes in two winning flavor combinations that your dog will love. This dog food nourishes your dog’s skin and coat, avoids sensitive stomach or allergy problems, contains vitamin E, multiple fatty acids and lots of other key nutrients that your dog requires. It was developed using a great deal of research and the expertise from more than 200 veterinarians. 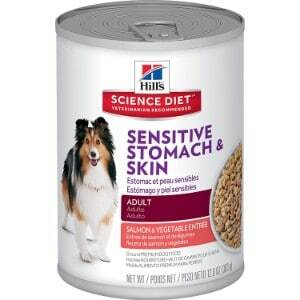 If you want a science-based approach to your dog’s nutrition, then you definitely want to go with Hill’s Science Diet. You should know about your dog before you buy food for him or her, because every breed is a little bit different, and you want to make sure that you give your dog the best possible food for optimal health. There are lots of accessories that you can get for your dog including a dog crate, dog bed, dog playpen, dog house or outdoor dog kennel, but understanding your breeds requirements always helps you choose the best one. That same goes for the type of dog food that you get. It isn’t just a simple as whether you need wet dog food or dry dog food or something like puppy milk replacer for very young dogs. There is a lot of information that goes into choosing the right dog food. First, let’s take a closer look at Jack Russells specifically, so that you can understand your dog better and that will help you get the right food for them. Jack Russell Terriers are high-energy breed that are known for their bold personalities. They originally began his fox hunting dogs, so they love digging, running and stalking prey. They are extremely active even though they are quite small, and although they do tend to bark a lot, they can be trained not to bark when they are not supposed to. Jack Russell Terriers are very popular dogs, and their small stature makes them perfect for people that have limited space to keep a dog. The type of food for Jack Russells is pretty much the same as for most dogs. There are a few differences to be aware of, but the type of food that you get them should always be grain-free dog food and organic dog food whenever possible. Obviously, you always want to have food that is high in protein unless your dog has a health problem that requires a lower protein diet, and they should be getting at least 5 to 7 percent of their diet from fat. Jack Russell Terriers also need food that has a crunchy texture so that they can keep their teeth clean and sharp. The best plan when it comes to feeding Jack Russell Terriers is to give them a diet that is at least 75 percent dry food. The crunchy texture of this type of food will reduce plaque and tartar on their teeth. There are things that you can do to take care of your dog’s teeth – products you can buy for instance – but you should not have to as long as you give them mostly dry food. You also may want to divide your pet’s food into three or four different mealtimes in order to give them the best chance of digesting the food properly as possible. Larger meals will be more difficult to digest. But if they eat smaller meals, then they have time to digest those meals before the next one comes along. Each breed, size and age of dog has different calorie requirements. It is not as simple as choosing food for small dogs or food for large dogs, although if you look at dog food bags or product listings that have dog food, they will often divide up their food into food for large breeds, food for smaller breeds, food for toy breeds and so on. However, you can go online and actually calculate how many calories your dog requires. Of course, part of that is knowing how much activity your dog gets. You can get a basal metabolic rate if they are just running around the house or yard, but for any additional exercise or high-level activity, you should count those calories separately. If you know how many calories your dog requires, and how many calories he or she is eating, then you are able to adjust to increase or decrease them depending upon whether your dog needs to gain weight or lose some. It is also important to keep in mind that is your dog ages; he or she will need fewer calories. There are certain ingredients that you want to look for when it comes to feeding your Jack Russell Terrier properly. The first thing that you want to do is make sure that your dog is getting enough protein. There are a couple of things to keep in mind here. First, your dog needs more protein and fat is a puppy than as an adult dog. For example, a puppy should be getting around 25 percent protein from their dog food and around eight percent fat; adult dogs can make do with a little less but it should never be less than 18 percent protein and five percent fat. However, there are other ingredients that you should be looking for as well. You want to make sure that your dog is getting plenty of omega-3 and omega-6 fatty acids, as well as other ingredients or nutrients that help them with brain health and digestion and even their immune system. For example, ensuring that your dog gets enough glucosamine and chondroitin for joint health and immune system problems is vital. You may wish to look for foods that contain other nutrients as well such is any particular vitamins that you don’t think your dog gets enough of. Normally, dog food manufacture will ensure that these foods contain the nutrients that your dog needs. Of course, there are also certain ingredients that you want to avoid. For example, you want to make sure that there is no grain, no wheat and absolutely no fillers whatsoever in your dog food. It can also be useful to make sure that there are no artificial flavorings, no artificial colors and no preservatives or anything else that isn’t natural with your dog food. You want dog food that is as close as you can get it to what your dog would’ve eaten out in the wild. Remember, as they have evolved for hundreds of thousands of years, their bodies have become used to a very specific type of diet. In order to be as healthy as possible, they need to be eating that very same diet. One of the most common things that Jack Russell Terriers experience includes bloating or discomfort. They may need dog food for sensitive stomachs if this is the case. In addition, there are some health conditions that require low-protein dog food and specific dog food for allergies. You also may need to feed them age-related food like senior dog food if they are eight years old or older. If your dog does experience food allergies, it is likely to come in the form of what is called the atopic dermatitis. Most dogs experience allergies on their skin rather than the sort of allergies that humans may experience such as trouble breathing. If you notice that your dog breaks out in hives or itches a great deal, then it might be attributed to a food allergy. Some other symptoms include excessive licking and biting, dry skin, red patches and hair loss. However, allergens do not always have to come from food. Pollen, insect bites and molds can also be causes of your pet’s allergies. You can contact your vet if you are not able to pin down the source of your pet’s allergies. If you want to know how to feed your Jack Russell Terrier, the one thing that you want to keep in mind is that you should never simply allow your dog to eat as much as they want. Automatic food dispensers have been a very popular product on the market because they take a great deal of work away from the pet owner. However, the least expensive models simply use gravity to refill the dog bowl whenever your pet eats something. This allows them to eat as much as they want and may promote obesity. If you want your dog to stay healthy, then instead of using a gravity-based automatic food dispenser, you may want to spring for a more expensive model that dispenses a preset amount of food at certain times during the day. This allows you to both automate the process of feeding your dog and control the number of calories that they are eating. Some additional things to keep in mind is how many calories the dog treats that you give you dog contains and whether they need additional consumables like dental chews to keep their teeth healthy. There are also some other health problems that can affect Jack Russell Terriers in particular. One of them is called Myasthenia gravis, and it is a genetic neuromuscular disease. It causes weakness and difficulty in movement for Jack Russell Terriers. You may want to check with your vet if you think your dog may have this condition. Finally, you also want to try to raise your food dishes so that they are level with your Jack Russell’s head. This will make feeding easier and prevents problems with digestion and swallowing. While a good diet may not be able to prevent all the health problems that Jack Russell Terriers can experience, it will certainly go a long way towards preventing them and treating them if they do arise. The bottom line is that there are plenty of things to consider when it comes to buying the right food for your Jack Russell Terrier. These are amazing dogs that make awesome companions and have lots of energy. You want to make sure that you are giving them all of the protein and fats that they need in order to stay healthy. You don’t want to be feeding them food that has fillers or grain or other ingredients that they simply do not need in their bodies. Instead, you should be giving them a diet that is as close to what they would be eating out in the wild as possible, and luckily, there are plenty of high quality dog foods on the market that provide that exact nutritional profile.